One Oxfordshire grower has added more furrows to boost output and efficiency with rotational ploughing. Geoff Ashcroft reports. Despite advances in min-till systems when it comes to reducing establishment costs, the importance of clean seedbeds remains high on the list of cultivation objectives for Oxfordshire grower Philip Green. As part of the Blenheim Estate, Green Farms is met with a variety of soil types across its acreage. While two thirds of the farm is faced with Cotswold brash, the remainder is a mix of gravel and heavy clay soils. The farm favours a predominantly min-till regime using a 5m Top Down and 8m Vaderstad Rapid drill for its 1,100ha (2,700-acre) workload, though there is a need for rotational and winter ploughing, ahead of spring crops. As a result, Akeman Street Farm turns over about 450ha (1,110-acre) each season. It is a workload which requires a committed approach to soil inversion. And the farm’s recent purchase of a 10-furrow Kverneland reversible to harness the high power of a frontline tractor, confirms its place in the cultivation line-up. “We had been using a PB100 six-furrow model, then progressed to a seven-furrow vari-width to make the most of our 200hp John Deere 7920,” explains Mr Green. 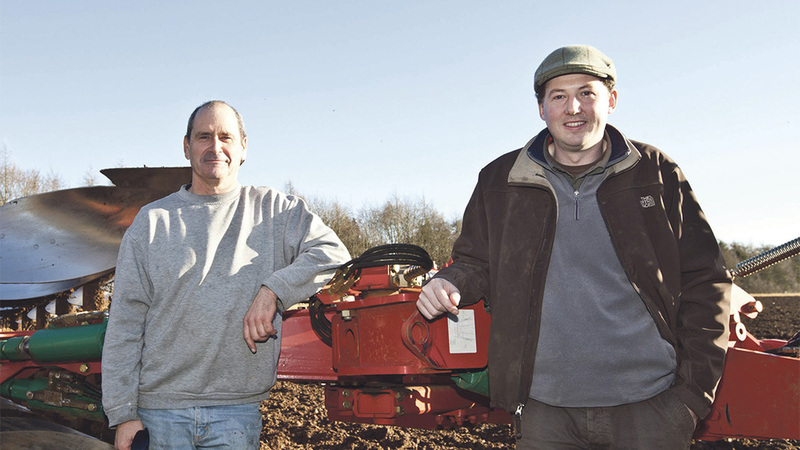 Philip Green (right) and operator Glyn Jones are pleased with the switch to on-land ploughing. 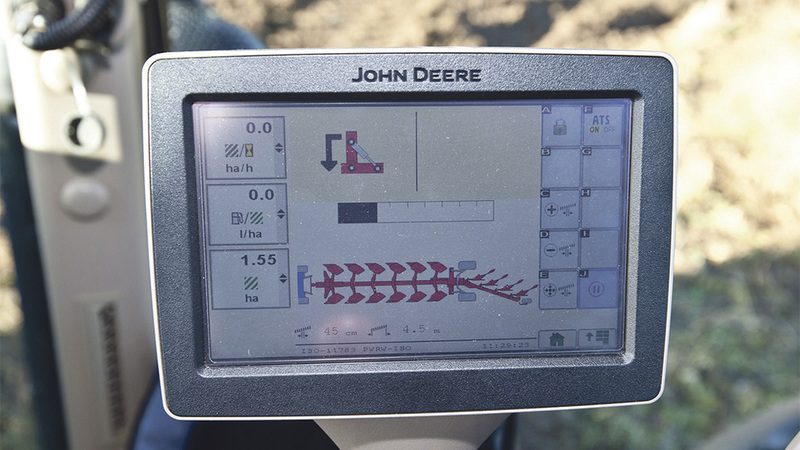 The 10-furrow auto-reset PW is a 6+3+1 build and offers flexibility in work. Essentially two ploughs in one, the PW plough is assembled as two units – the rear section can be three or four furrows and is carried on a three-point linkage at the rear of the front, six-furrow plough. Packomat furrow presses provide enough consolidation to follow with the drill. This design enables both sections to be separated and used independently. And the 3+1 build of the rear plough also allows the last furrow to be removed, if needed, to create a nine-furrow unit. 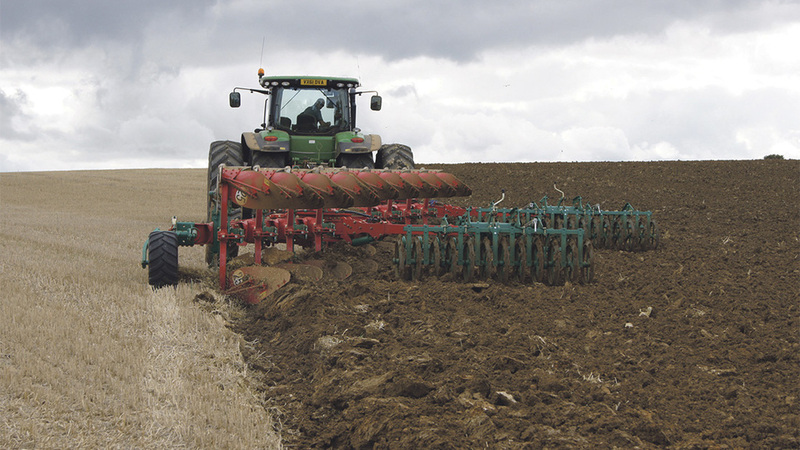 For Philip Green, such a plough creates the option of using the six-furrow front section or four furrow rear sections on smaller tractors, though so far, the farm has not needed to split the plough. “We have carried the rear section in the air on some of the steeper banks, or if some of our banks get a bit too greasy after a shower of rain,” he says. Furrow widths are hydraulically variable, with most autumn work carried out at 46cm (18in). A narrower, 40cm (16in) furrow is favoured for winter ploughing. “With its ability to work on-land, the PW plough saves us a lot of time by allowing the dual wheels to stay on the tractor when switching between ploughing, cultivating and drilling,” he says. Isobus integration and automatic turnover sequence makes handling a big plough very easy.